Scientists uncover new way to target breast cancer receptor cells. 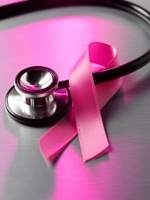 Scientists have uncovered a new way to target previously untreatable breast cancer receptors. There are so many different types of cancers that affect people in many ways. One of the types of breast cancer is HER2-positive breast cancer; this means that you have a protein called human epidermal growth factor receptor 2, which encourages the growth of more breast cancer cells. There are already cancer drugs that can block the HER2 receptors and limit their growth, but about one in five breast cancer tumors lacks the receptors and so the cancer drugs cannot specifically target these cancer-promoting receptors. Scientists call these types of cancers “triple-negative” because they’re so difficult to treat. Since the cancer drugs that work on some people’s HER2 receptors don’t work on the people with triple-negative cancer, researchers have tried to find other ways to target them. They’ve discovered another receptor called EGFR that also promotes the growth of cancer cells, but so far, no drugs have been found that can block EGFR effectively. But that’s why researchers at the Weizmann Institute of Science in Israel are studying new drugs that can destroy EGFR, and thus stop the multiplying of cancer cells in these breast cancer patients. Their study, published in the Proceedings of the National Academy of Science, found a solution: treat triple-negative breast cancer with two EGFR blocking antibodies at the same time, instead of just one. PLUS: Ancient Chinese technique that eases breast cancer symptoms. They studied the effect on mice with triple-negative breast cancer and found that using two antibodies actually did prevent the spread of triple-negative tumors. The most revolutionary part of their research was that treating this molecule with two antibodies simultaneously worked much better than if you were to treat it with the same antibodies, one after the other. Why? Well, the combined weight of the two antibodies actually caused the EGFR molecule to collapse inwards and prevent its growth. Then, the cancer cells stopped receiving growth signals from the EGFR molecule. This has the potential to dramatically change the way breast cancer is treated—and hopefully get us closer to finding a cure. Ferraroa, D., et al., “Inhibition of triple-negative breast cancer models by combinations of antibodies to EGFR,” Proceedings of the National Academy of Sciences 2013; 1,815-1,820. “Two Antibodies Are Better Than One,” Weizmann Canada February 2013; http://weizmann.ca/images/stories/breaking_news/science-tips-feb-2013-2.pdf, last accessed February 19, 2013.